I did make mine on a bright sunny day, and that is why I am so happy with the lighting in these pictures. As I practice more with my new camera , I am learning the best times of the day, locations and angles to get the best lighting. I’ve often wondered what the neighbors must think to see me stretched out on the floor of the front porch delicately arranging jalapenos and hot dogs, but I think the location is perfect! Making these takes a bit of time, but they’re not hard. They start with a simple yeast dough. While it’s rising, prep the cheese and jalapenos. Yeast dough is very hard to mess up, unless the yeast is dead. Just don’t use too hot of liquid or expired yeast and you shouldn’t have a problem. Once the dough is ready, roll it into long flat strips, about an inch wide by twelve inches long. 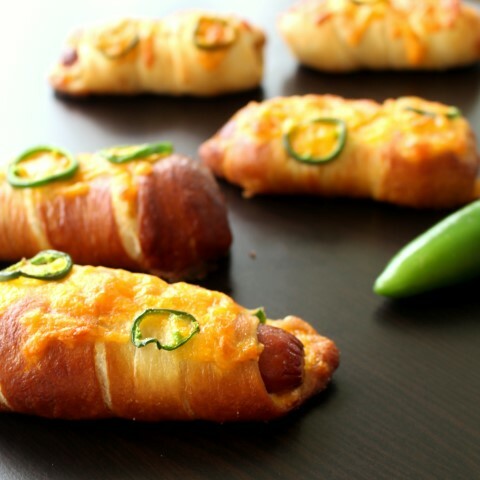 Spread the strip with a bit of cream cheese and sprinkle with jalapenos and cheddar. Roll ’em up an watch ’em raise. While they’re raising, start preheating your oven and prepping the boiling water. Boiling them for about a minute and a half in a mixture of water and baking soda is what will give them their lovely chewy pretzel texture. Skip this step and you’ll end up with a simple hot dog bun. Not bad, but not nearly as fun as a chewy pretzel. Bake for a bit and enjoy the sunshine in your mouth. What is your favorite thing to make on a rainy day? Add the yeast, hot water, oil and sugar to a large bowl and mix. In a separate bowl combine the flour, and salt. Add to yeast mixture. When dough forms a ball, place on counter and knead for a few minutes until smooth. 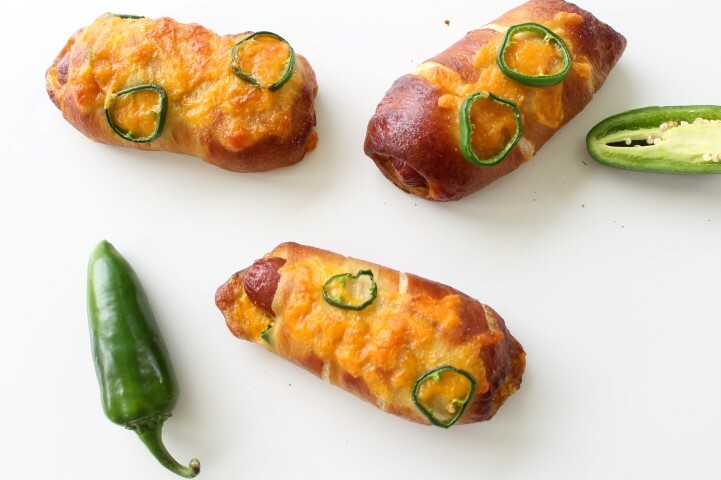 Divide dough into twelfths and let rest on the counter while preparing the jalapenos and cheese. Wash and remove ribs and seeds from jalapenos, unless you like the extra kick. Dice them finely. Roll each ball of dough into a 12 inch long rope. Flatten the rope until it is about an inch and a half wide. Spread a layer of cream cheese on the strip. The cream cheese spreads best if it has been warmed up in the microwave for a few seconds. Preheat oven to 375 F. Bring 8 cups of water and 4 T baking soda to a boil in a medium saucepan. Drop hot dogs into the water 2 at a time and boil for 45 seconds on a side. Remove from water back to the cookie sheet. Brush the dough with a beaten egg and sprinkle with kosher salt. Bake for 15 to 20 minutes or until deep brown in color. Remove them immediately from the cookie sheet to a wire rack. They are best when enjoyed warm straight from the oven. You are right, a definite hero of flavors here! I love poppers, but never thought of adding a hotdog in too! Thanks, Lisa! the hot dog adds enough protein to make a good excuse to have them for a meal! Love how these are wrapped, they look incredible!! Oh wow. If my husband were peeking over my shoulder, these are all he’d talk about until I whipped them up 😉 YUM! You say in the directions add flour salt and gluten, but you didn’t specify how much gluten. Sorry about that, Karen. I made a mistake in the directions. The recipe isn’t supposed to have any gluten. I will remove the reference from the directions. Thanks for catching that. What a creative idea! They look really good! Your photos are amazing too! My hubby would be all over these bad boys!! 😉 They look awesome! My husband loved them too, Jocelyn. Thanks for stopping by! Ugh, I cannot wait to try this. 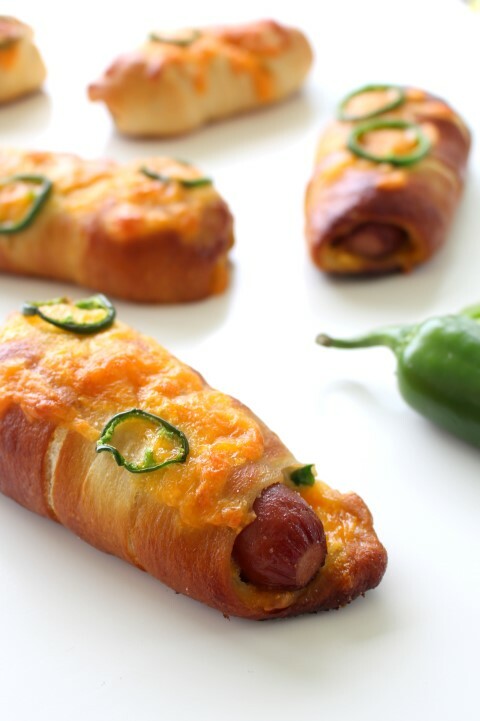 Love jalapeno poppers and love pretzels dogs. Combining the two? MIND B-L-O-W-N!!!!! Question: the picture looks like you have cheese and peppers on the outside, but the recipe calls for just sprinkling them with salt. If I wanted to add the cheese and peppers, when would I do so? Right before they go into the oven. If they start to brown toward then end of the baking time, lightly rest a piece of foil on them. Let me know how they turn out if you make them! 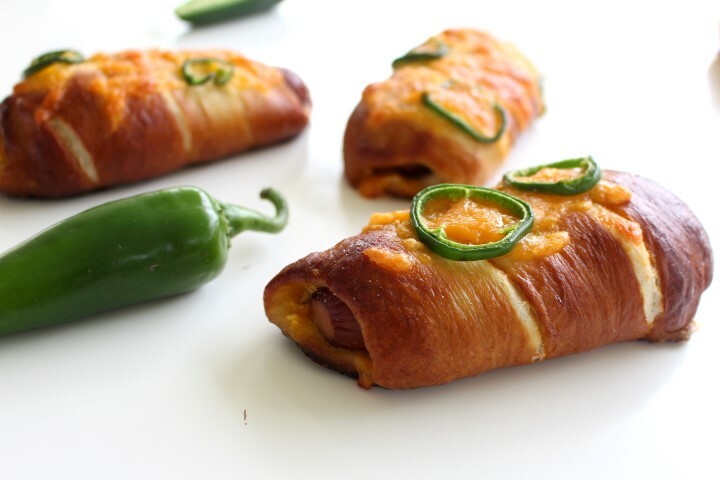 Do you cook the hot dogs first and then wrap the dough around? Cause steps 7-9 are confusing. Hi Dae, There is no need to cook the hot dogs first. They will bake in the oven with the dough. If you another specific question, let me know! Hi – I noticed that ‘hot dogs’ are not included in the recipe. Would I be correct that this recipe calls for 12 normal sized hot dogs, or are they cut in half, or something else all together?? Thanks for the amazing looking recipe. Can’t wait to try it! That would be correct. They are whole hot dogs. Sorry I didn’t notice that. If I wanted to use store bought dough, would pizza dough work the same? Or another type of dough and then follow the directions with boiling, etc.? I’m not sure since I’ve never tried it. I’d imagine it would work the same, but can’t say for sure. Let us know if you try it.